Keep the well-proven and improve it with the latest technologies: this was the motto for the development of the TWIN 5. The goal was to further optimize SWING´s most successful tandem glider. This was achieved with an improved leading edge design, 3D-Shaping, the use of flexible and durable rigid elements and other changes. The result: excellent start properties and an extremely stable canopy. 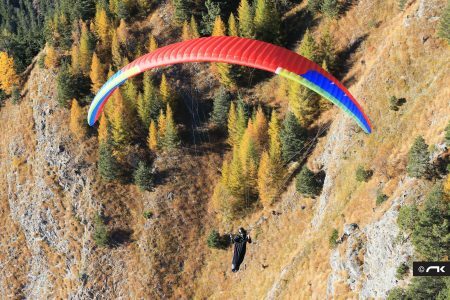 Just like its predecessor, the TWIN 5 offers great handling – almost like a solo paraglider. SWING kept the well-known high degree of passive safety. Fans of the TWIN 4 may therefore look forward to a familiar feeling in flight. Once in the air, you will feel its great speed range and the glide performance, which could be increased using 3D-Shaping on the leading edge. At the end of the flight, pilot and passenger can look forward to a soft landing. This is based on the great slow flight characteristics, the gentle stall properties and an excellent flare behavior. The TWIN 5 is ideal for professional tandem businesses. Especially with difficult conditions you will appreciate its optimal take-off and landing characteristics. So each flight begins and ends with a high degree of security. 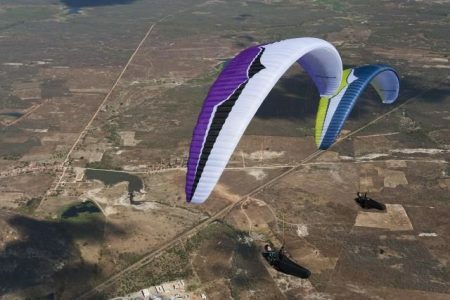 Next to professionals the TWIN 5 targets all tandem pilots who appreciate great handling and best glide performance for relaxed and beautiful XC flights. The TWIN 5 is also available as TWIN 5 S. Made for lightweight passengers & children with a handling like a solo glider. Maximum load capacity for the S size is 190kg. Good news for big boys: Using the “Vario”-risers, TWIN 5 S is also certified for solo use.